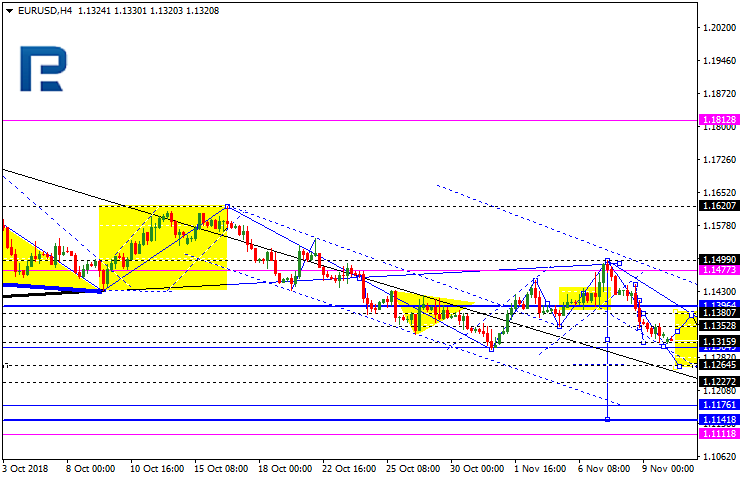 EURUSD is forming the fifth descending wave; it has already reached the target of this wave’s first structure. Possibly, the price may be corrected towards 1.1380 and then resume falling with the short-term predicted target at 1.1265. After that, the instrument may test 1.1300 from below and then resume trading inside the downtrend with the main target at 1.1150. 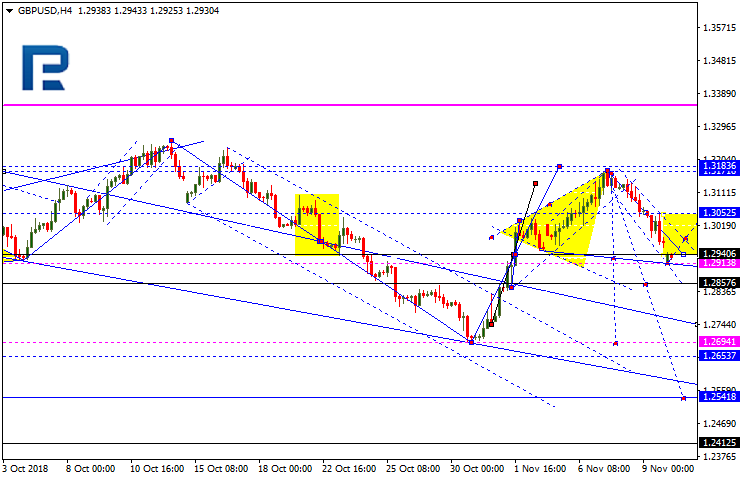 GBPUSD is also forming the fifth descending wave; it has already reached the target of this wave’s first structure. Possibly, today the pair may start a new correction to 1.3053 and then resume falling to reach the short-term predicted target at 1.2800. Later, the market may test 1.2913 from below and then resume trading inside the downtrend towards the main target at 1.2655. 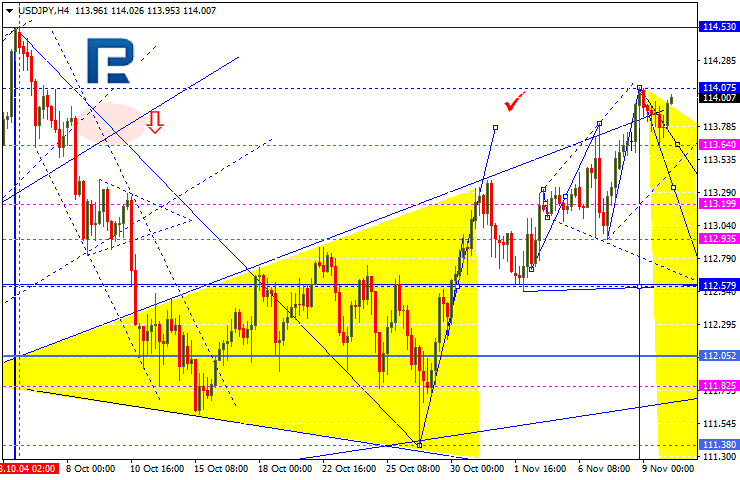 USDJPY has reached the target of the fifth ascending structure. 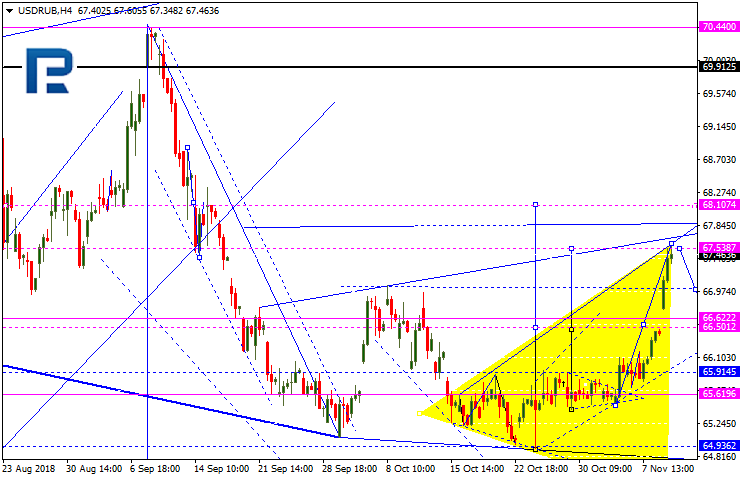 Possibly, today the price may consolidate near the highs. If later the pair breaks 113.64 to the downside, the instrument may form a new descending structure with the first target at 112.57. Later, the market may resume growing towards 113.64. 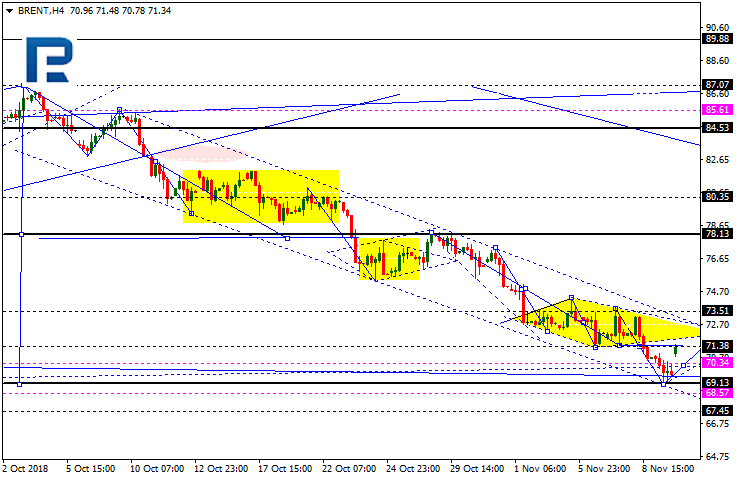 AUDUSD is forming the first descending wave with the target at 0.7205. After that, the instrument may start a new correction to reach 0.7252 and then resume trading inside the downtrend with the short-term target at 0.7137. USDRUB is still growing. Possibly, the price may be corrected towards 68.10. 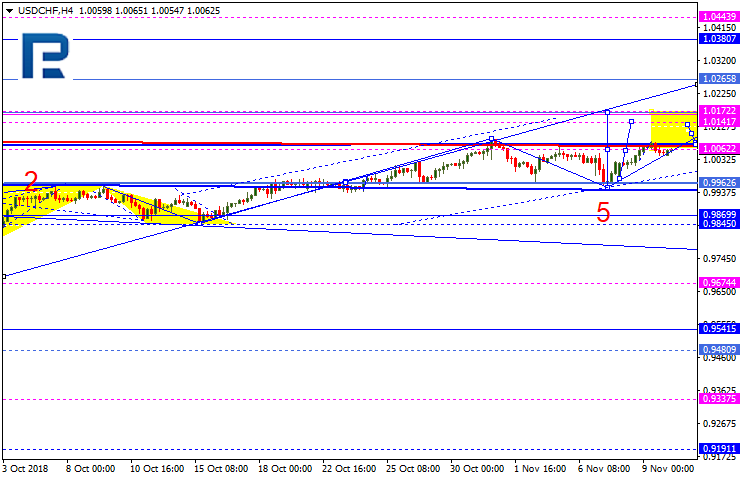 Today, the pair may consolidate near the current levels. If later the instrument breaks this range to the downside, the market may form one more descending structure to reach 66.50 and then resume growing to return to 68.10. 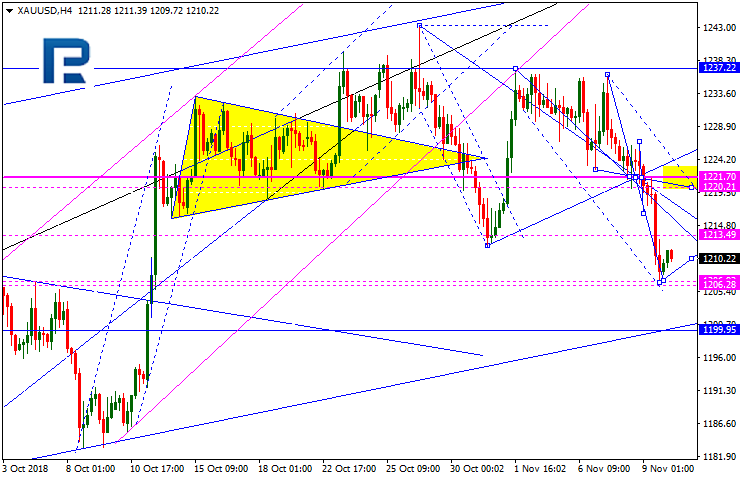 Gold is falling towards 1206.30. After that, the instrument may resume growing to reach 1220.20 and then start another decline with the target at 1200.00. The market is expected to form the five-wave Flag correctional pattern. Brent has returned to 71.38. 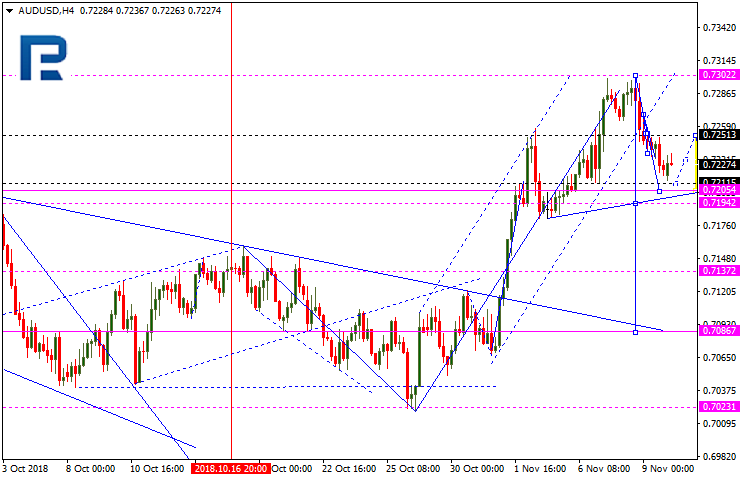 Today, the pair may fall to reach 70.30, thus forming a new consolidation range. If later the instrument breaks this range to the upside, the price may start a new correction to reach 73.50; if to the downside – expand the range towards 68.50.